Commemorates Victory over Japan Day, in which the United States and the Soviet Union liberated Korea from Imperial Japanese colonial rule which lasted from 1910 to 1945. The National Liberation Day of Korea is a holiday celebrated annually on August 15 in both North and South Korea. It commemorates Victory over Japan Day, when U.S. and Soviet forces ended the decades-long Japanese occupation of Korea. It is notable for being the only Korean public holiday celebrated by both North and South Korea. In South Korea it is known as Gwangbokjeol (광복절; literally, "the day the light returned"), and is one of the public holidays in South Korea. 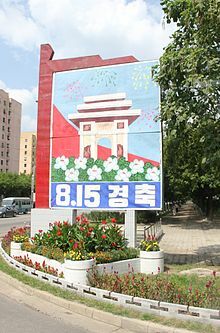 In North Korea it is known as Chogukhaebangŭi nal (조국해방의 날; literally Liberation of the Fatherland Day), and is also one of the public holidays in North Korea. 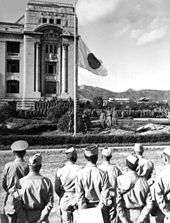 A Japanese flag at Seoul being lowered in 1945 as U.S. soldiers watch. After the Korean Peninsula was liberated by the Allies in 1945, independent Korean governments were created three years later, on August 15, 1948, when the pro-U.S. Syngman Rhee was appointed first President of South Korea and pro-Soviet Kim Il-sung was made first Leader of North Korea. Gwangbokjeol was officially designated a public holiday on October 1, 1949 in South Korea and is known as Chogukhaebangŭi nal (조국해방의 날; literally "Liberation of Fatherland Day") in North Korea. North Korea currently celebrates this holiday along with South Korea. Liberation Day is the only Korean holiday that is celebrated by both countries. In North Korea, it is typical to schedule weddings on the holiday. On 5 August 2015, the North Korean government decided to return to UTC+08:30, effective 15 August 2015, and said the official name would be Pyongyang Time or (PYT). The government of North Korea made this decision as a break from 'imperialism'; the time zone change went into effect on the 70th anniversary of the liberation of Korea. In South Korea, many activities and events take place on the holiday, including an official ceremony attended by the President of the Republic either at the Independence Hall of Korea in Cheonan or at the Sejong Center for the Performing Arts. All buildings and homes are encouraged to display the South Korean national flag Taegukgi. Not only are most public museums and places open free of charge to the descendants of independence activists on the holiday, but they can also travel on both public transport and intercity trains for free. The official "Gwangbokjeol song" (광복절 노래) is sung at official ceremonies. The song's lyrics were written by Jeong Inbo (정인보) and the melody by Yoon Yongha (윤용하). The lyrics speak of "to touch the earth again" and how "the sea dances", how "this day is the remaining trace of 40 years of passionate blood solidified" and to "guard this forever and ever". In 1974, Yuk Young-soo, First Lady of South Korea and spouse of Park Chung-hee, was assassinated by Mun Se-gwang at the National Theater of Korea in Seoul during a Gwangbokjeol ceremony. The Peak aka Life of Lee Youk-sa, the Poet who Embraced Epoch, starring Kim Dong-wan of boyband Shinhwa is a two-part special drama broadcast on MBC to commemorate Gwangbokjeol. It is on the life of poet and independence activist, Lee Youk-sa, who lived during the Japanese Colonial Period, and died in prison at 40 leaving behind some 40 pieces of poetry. The third drama rendition of Park Gyeong-ni's epic novel Toji (literally "The Land"), is a 52-episode historical drama which aired from 27 November 2004 to 22 May 2005, was broadcast by South Korean broadcaster SBS as commemoration of the 60th anniversary of Gwangbokjeol; and the only drama rendition after all 21 volumes were completed. ^ Seol Song Ah (7 December 2015). "Kim Jong Un's birthday still not a holiday". Daily NK. Retrieved 13 January 2017. ^ "North Korea to introduce new timezone this month". BNO News. 7 August 2015. Retrieved 7 August 2015. ^ "North Korea's new time zone to break from 'imperialism'". BBC News. 7 August 2015. Retrieved 7 August 2015. ^ Mathis-Lilley, Ben (7 August 2015). "North Korea Invents New Time Zone, 'Pyongyang Time'". Slate. ^ Ho, Stewart (24 April 2012). "Kim Dong Wan's MBC Drama Receives Award at Houston International Film Festival". enewsWorld. CJ E&M. Retrieved 16 December 2012. ^ "List of Korean Historical Dramas (1981-2002) - Chicago Korean Drama Fan Club". deiner.proboards.com. This page was last edited on 24 April 2019, at 09:16 (UTC).